When Audrey Fish and her husband picked up their lives and moved from Ohio to California, they had two plans: to get away from the snow and to get a dog. A special education teacher, Fish felt like a rescue dog with special needs would be a good fit for her personality. Intrigued by the dog-friendly nature of Los Angeles, the pair started looking at rescue websites shortly after settling in L.A. and soon spotted an adorable face they couldn’t forget. “We just saw his picture, and we were like, that’s the dog,” Audrey remembers. That dog was Seamus, a 20-pound mixed breed who was then 2 years old and wasn’t exactly thrilled with shelter life. A former stray, Seamus had been pulled from a high-kill shelter by Lange Foundation, but wasn’t showing well in their adoption center. Not friendly may have been a little bit of an understatement. In fact, Audrey says, Seamus had been on the brink of being legally labeled as aggressive by the time they met. Assumed to be a Poodle-Terrier mix, Seamus was as cute as can be, but he was also very reactive. “He snarled at me the first time we ever met him and tried to run away from us,” Audrey recalls. Despite Seamus’s fearful first impression, Audrey and her husband decided to give him time to get to know them, so they took him out for a little walk. As Audrey remembers it, passersby moved out of the way as Seamus strained on his lead, barking madly at other dogs. She’d been sure Seamus would be the dog for her family, but now she wasn’t so certain. When the couple arrived back at the shelter with the dog that seemed to want nothing to do with them, something happened to change Audrey’s mind. As they approached the building, a volunteer pulled up and got out of her car, and instantly, Seamus’s demeanor changed. Maybe he did like some humans after all. “He was barking, he was jumping on her, he was licking on her, and at that point we knew this was a good dog who has had a rough life,” says Audrey. It turned out the woman who Seamus was lavishing with licks was a volunteer who walked him five days a week, someone whom he had built a bond with and had come to trust. Buoyed by Seamus’s demonstration of affection, Audrey and her husband decided they still wanted to adopt him. It was clear he needed time to get to know them, so instead of taking him home that day, the couple went at Seamus’s speed. “By the third visit, he let me pick him up,” says Audrey, who decided to finally make things final when Seamus was comfy in her arms. Two years on, Audrey says Seamus is a completely different dog than the one they met in the shelter that day. “He’s smiley and friendly,” she says, noting that while Seamus is still very fearful around large dogs, he’s made plenty of small-breed friends. He’s accepting of most people — even Audrey’s young niece and nephew. Although he was listed as a Poodle-Terrier in the shelter, a DNA test revealed Seamus isn’t a Terrier at all. He’s actually 40 percent Chihuahua — the one breed Audrey and her husband had absolutely ruled out before beginning their shelter search. 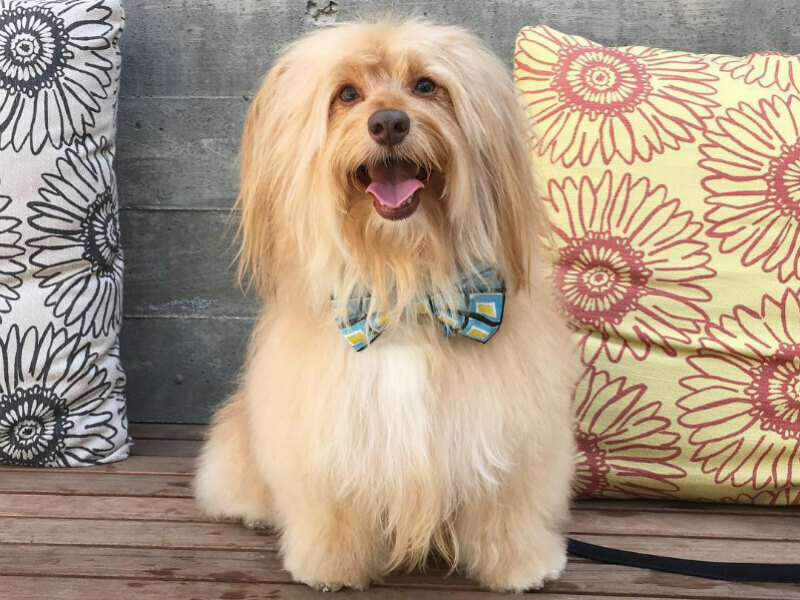 Undaunted by his surprising genetics, Seamus is now a confident dog model, donning all the doggy bow ties Audrey sells through her Etsy store. When he’s not showing off for his growing Instagram following, Seamus can be found accompanying Audrey’s husband to work. The dog is now very close with Audrey’s spouse, a computer programmer, and feels very comfortable around the office. On the days that Seamus can’t go to work with his human, the couple have a dog walker come by. Seamus loves her as much as he loved his faithful five-day-a-week walker back at the shelter. Two years into life with Seamus, Audrey is as thankful for that woman as Seamus once was.